Back in the day, beaded evening bags were the height of glamour and sophistication. You’ve seen them in many old photos and illustrations. 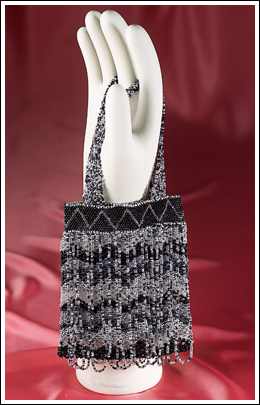 We found this updated version in a great zig-zag design made of black, silver, clear and hematite glass seed beads with stitched beaded handles. The pouch part measures 6” X 5” from the base of the handles, and is just the right size to hold a comb, lipstick, hankie and keys.